We define ``planet'' as follows. A ``planet'' is an object that has a mass between that of Pluto and the Deuterium-burning threshold* and that forms in orbit around an object that can generate energy by nuclear reactions. The International Astronomical Union position statement. * Deuterium Burning Limit: Objects less massive than 13 Jupiter masses never burn Deuterium nor generate significant energy from any nuclear reactions. Fortuitously, this Deuterium-burning limit at 13 Mjup resides near the upper-end of the observed planet mass distribution. Thus 13 Jupiter masses constitutes an arbitrary but doubley motivated limit. Corollary #1: Observations may enhance but not authenticate planet status. Corollary #2: Sharp parameter boundaries for the domain of "planets" can be neither physically nor empirically justified at this time. Objects which have masses and formation histories near the perimeter of the adopted parameter domain constitute part of a natural continuum. The observed mass distribution of companions to nearby stars motivates the upper mass limit. Without the empirical mass distribution, no upper mass limit would be compelling. The mass distribution exhibits a clear paucity above 5 to 10 Mjup. Less than 1% of stars harbor companions having more than 10 Mjup within 10 AU . The mass distribution rises steeply toward smaller masses, down to the detection limit near 1 Mjup. 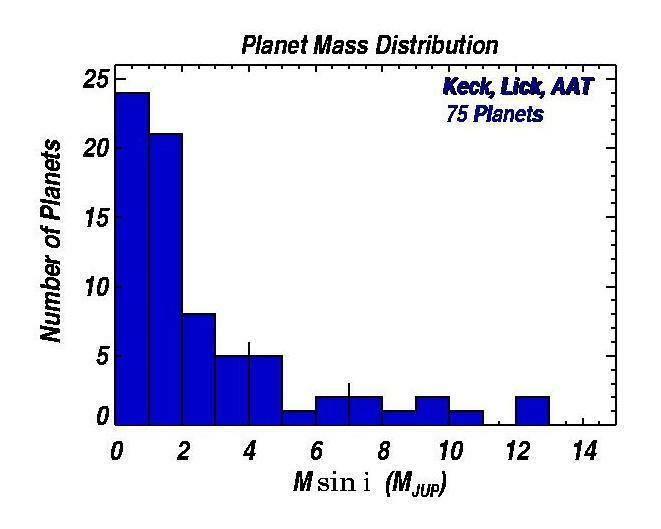 This mass distribution empirically motivates an upper boundary for planetary masses at about 10 Mjup. Thus the empirically-based upper mass limit for planets resides at 10 MJUP and coincides conveniently with the boundary of nuclear Deuterium burning at 13 Mjup, making this proposed upper mass limit for planets analogous to the substellar boundary for H-burning. Return to planet search home page.